1Hawaii Center for Volcanology and Department of Geology and Geophysics, University of Hawaii at Manoa, Honolulu, HI 96822, USA. 2Department of Meteorology, School of Ocean and Earth Science and Technology, University of Hawaii at Manoa, Honolulu, HI 96822, USA. 3Now at SETS Technology, Inc., 30 Kalehu Ave. #10, Miliani, HI 96789. 4Also at Philippine Institute of Volcanology and Seismology, Quezon City, Philippines. The 1991 eruption of Pinatubo produced about 5 cubic kilometers of dacitic magma and may be the second largest volcanic eruption of the century. Eruption columns reached 40 kilometers in altitude and emplaced a giant umbrella cloud in the middle to lower stratosphere that injected about 17 megatons of SO2, slightly more than twice the amount yielded by the 1982 eruption of El Chichón, Mexico. The SO2 formed sulfate aerosols that produced the largest perturbation to the stratospheric aerosol layer since the eruption of Krakatau in 1883. The aerosol cloud spread rapidly around the Earth in about 3 weeks and attained global coverage by about 1 year after the eruption. Peak local midvisible optical depths of up to 0.4 were measured in late 1992, and globally averaged values were about 0.1 to 0.15 for 2 years. The large aerosol cloud caused dramatic decreases in the amount of net radiation reaching the Earth's surface, producing a climate forcing that was two times stronger than the aerosols of El Chichón. Effects on climate were an observed surface cooling in the Northern Hemisphere of up to 0.5 to 0.6°C, equivalent to a hemispheric-wide reduction in net radiation of 4 watts per square meter and a cooling of perhaps as large as -0.4°C over large parts of the Earth in 1992-93. Climate models appear to have predicted the cooling with a reasonable degree of accuracy. The Pinatubo climate forcing was stronger than the opposite, warming effects of either the El Niño event or anthropogenic greenhouse gases in the period 1991-93. As a result of the presence of the aerosol particles, midlatitude ozone concentrations reached their lowest levels on record during 1992-93, the Southern Hemisphere "ozone hole" increased in 1992 to an unprecedented size, and ozone depletion rates were observed to be faster than ever before recorded. The atmospheric impact of the Pinatubo eruption has been profound, and it has sparked a lively interest in the role that volcanic aerosols play in climate change. This event has shown that a powerful eruption providing a 15 to 20 megaton release of SO2 into the stratosphere can produce sufficient aerosols to offset the present global warming trends and severely impact the ozone budget. Stratospheric sulfate aerosols generated by the Pinatubo eruption cloud have had a far-reaching impact on the radiation budget, atmospheric and surface temperatures, regional weather patterns, global climatic changes, and atmospheric chemistry, including environmentally important atmospheric effects such as global ozone depletion. In this paper we review the widespread atmospheric impact of the Pinatubo eruption by considering the stratospheric injection and mass of the aerosol-generating sulfur gases (primarily SO2), the transport of the eruption cloud and conversion of SO2 to stratospheric sulfate aerosols, and the effects of this aerosol layer on radiation, weather, and climate. Local weather phenomena caused by the eruption are discussed elsewhere (Oswalt and others, this volume). We close with a short retrospective comparing the atmospheric effects of Pinatubo with those of other eruptions of the past century. For the past 4 years, the Pinatubo stratospheric aerosol cloud has provided an exceptional natural laboratory for atmospheric scientists. 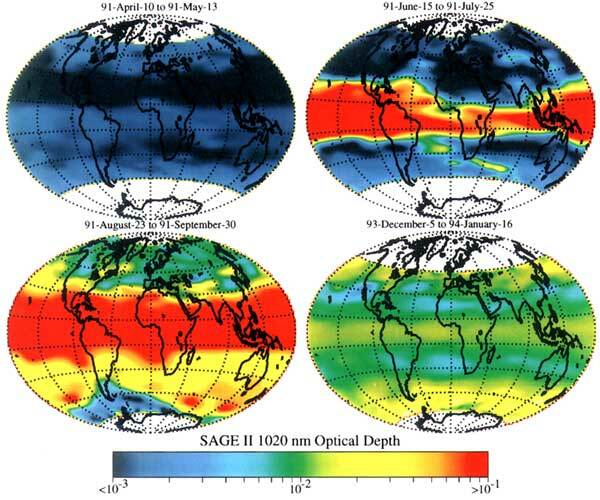 The presence of the volcanic aerosol veil with a peak global midvisible optical depth ( ) of at least 0.1 (Sato and others, 1993), initial radiation losses of up to 5% for the first 10 months (Dutton and Christy, 1992), and the concomitant, measurable climate anomalies such as global surface cooling of perhaps in excess of 0.5°C in 1992 (Dutton and Christy, 1992; Hansen and others, 1993) have produced tremendous excitement in the atmospheric science community. Measurements of Pinatubo aerosols and their effects on the Earth's climate system will enable validation of the new generation of global circulation models, improve our understanding of global aerosol dispersal and decay (and thus stratospheric circulation), and permit testing of models of aerosol formation. They will also provide better knowledge of controls on the global ozone budget, and will throw light on problems such as why surface cooling is clearly documented after some eruptions (for example, Gunung Agung, Bali, in 1963; Hansen and others, 1978) but not others--for example, El Chichón, Mexico, in 1982 (Angell, 1988; Ramanathan, 1988). Intense interest in the atmospheric aftermath of Pinatubo has been expressed by the tremendous proliferation of papers published since 1991 on the aerosol cloud and its effects. A representative portion of this considerable body of information has been canvassed for this study, but the authors are aware that many studies, especially some of those published after Fall 1993, when this paper was written, are not quoted herein; to the authors of those works we extend our apologies. Obviously, the optimum time for complete evaluation of the atmospheric effects of this exceptional eruption will be in a few years, when the results of many studies in progress are available. It is important both to overall considerations of the size of the Pinatubo eruption and to the volume of magma that accompanied the atmospheric injection of the SO2 cloud that we briefly consider the magma volume and how the material was ejected into the atmosphere. Moreover, some studies published in the nonvolcanological literature have made various erroneous claims regarding the size of the Pinatubo eruption, suggesting, for instance, that it was the century's largest eruption. We show here that the volume of erupted magma is not necessarily related to the size of the aerosol cloud generated, particularly in the case of Pinatubo (see also Gerlach and others, this volume), and we put the size of the Pinatubo eruption in perspective. As in most great eruptions (Rampino and Self, 1982), plinian eruption columns from a "point source" vent and co-ignimbrite eruption clouds (Woods and Wohletz, 1991; Koyaguchi and Tokuno, 1993; Koyaguchi, this volume) derived from the pyroclastic flows at Pinatubo contributed to the eruption column and cloud, and thus to the mass of SO2 injected into the atmosphere. The present best estimate of 8.4 to 10.4 km3 total bulk volume for Pinatubo 1991 ejecta is the sum of the ~5-6 km3 of bulk volume of ignimbrite (W.E. Scott and others, this volume) and the 3.4 to 4.4 km3 bulk volume of fallout deposits (Paladio-Melosantos and others, this volume). A dense rock equivalent (DRE) maximum of 3.7 to 5.3 km3 (W.E. Scott and others, this volume) is probably as good a figure as will be obtained. This value is in reasonable agreement with an independent volume estimate of ~5.5 km3 based on eruption column heights and durations obtained from satellite images of the eruptive system and models of eruption column dynamics (Holasek, 1995). Somewhat larger values (18 km3 bulk volume, which converts to <9 km3 DRE) are supported by modeling of the giant Pinatubo eruption cloud (Koyaguchi and Tokuno, 1993; Koyaguchi, this volume). The maximum and average heights reached by the eruption columns on June 12-15, 1991, are important in assessing the original altitude of injection of the ash and gas cloud. Table 1 shows all times during which emissions reached stratospheric elevations (see also Hoblitt, Wolfe, and others, this volume). The tropopause was at about 17 km over the Philippines during the eruption. Of most importance to the generation of the aerosol cloud is the period of 21 h from about 0555 on June 15 to 0300 on 16 June that had the highest eruption columns. During this period, a series of explosions beginning at 1027 on June 15 produced a fluctuating eruption column and umbrella clouds above the volcano (see Tokuno, 1991a) and gradually escalated into a 9-h-long climactic phase beginning before 1340. Examination of images from the Japanese Geostationary Meteorological Satellite (GMS-4) by Tokuno (1991A,B), Tanaka and others (1991), Koyaguchi and Tokuno (1993), and this study (fig. 1), provides some details of this part of the eruption, which was ill observed from the ground. It is noted elsewhere (Oswalt and others, this volume) that the closest pass of tropical typhoon Yunya to Pinatubo occurred just before the start of the climactic phase. Figure 1. 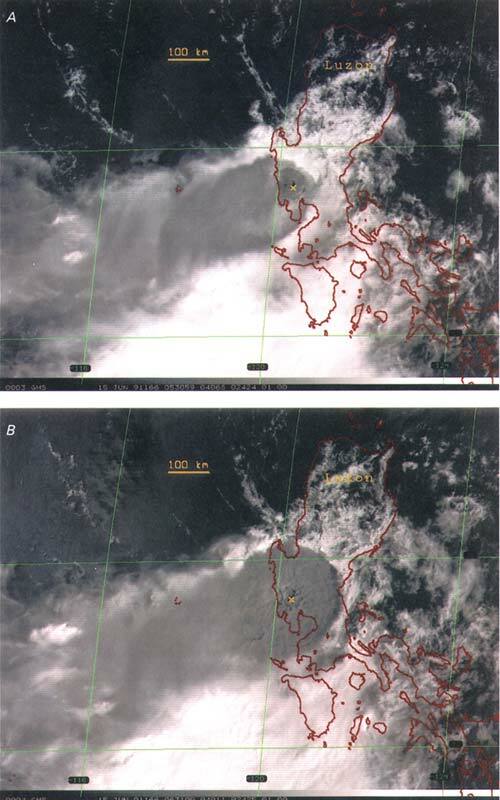 Japanese GMS visible- and thermal-IR wavelength satellite images of top of giant umbrella cloud developing above eruption column of Mount Pinatubo on June 15, 1991. A-D, Visible wavelength images spanning 3 h from 1340 to 1640 local time; E-H, Thermal-IR images at same times. Scale bar shows size of developing umbrella cloud; x in visible wavelength images marks center of Mount Pinatubo volcano. Color bar in bottom right of thermal-IR images gives instrument-perceived temperatures in degrees Celsius. Table 1. Chronology of ash columns with significant stratospheric injection of ash and volatiles during the June 1991 eruptions of Mount Pinatubo, Philippines. 4-5 km along the NW. flank. Pyroclastic-flow deposits enriched with dense andesitic dome fragments; fallout intense southwestward. Fallout dispersed W., NW., and SW. with pumice lapilli and coarse ash falling 15-20 km away from the vent; pyroclastic flows on the N., NW., and W. flanks. Formation of 200- to 300-m-diameter crater; partial destruction of andesitic dome; pyroclastic flow traveled 4-5 km NW. 15 min after onset of explosion; fallout toward SW.
Eruption appeared to issue from multiple vents; pyroclastic flows in the NW. flank reached 15 km downvalley. Eruption with subsequent pyroclastic flows on the NW. flank. Fallout at 25-30 km SW. to WSW. from the vent; pyroclastic flow was detected on the upper E. flank. Eruption with pyroclastic flows on the SW. and upper E. flanks. Generation of outwardly moving pyroclastic flows initially referred to as blast; ash column was momentarily visible, immediately obscured by elutriating ash. Gap in the seismic record; pyroclastic flows were observed on N. and NW. flanks. Eruption followed by successive explosions, ash cloud buildup, and dispersal. Beginning of paroxysmal eruption, consisting of several indistinguishable column formations and accompanied by massive deposition of pyroclastic flows all around the vent, pumice lapilli fallout, and large earthquakes. Formation of the summit caldera. Ball-shaped column emanating from the newly formed caldera. Wedge-shaped plume; last observed eruption-related ash column with height above 17 km. The first GMS image of the climactic phase collected at about 1340 (figs. 1A,E) shows the center of the eruption column located nearly over Pinatubo's vent, but it is difficult to pinpoint exactly where the center of the rising column is relative to the volcano in subsequent images as the column rises and grows. This is due to an offset introduced by the geometry of the spacecraft's look angle and position with respect to any non-nadir point on the Earth's surface; the offset increases with altitude of imaged objects above the surface (Holasek and Self, 1995). 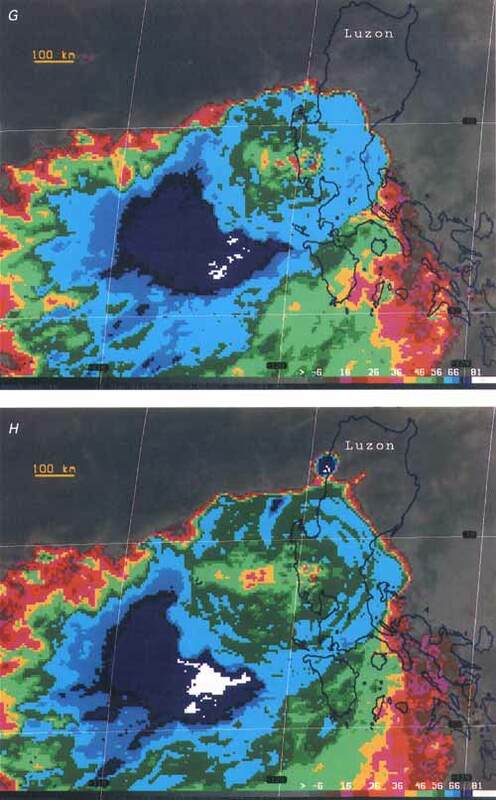 Tokuno (1991b) notes that in some of the satellite images presented in his work, the locus of the growing volcanic umbrella cloud moves off to 10 to 20 km west of Pinatubo, but the significance of this observation is difficult to evaluate without knowing details of the positioning (mapping) system used in creating these images. In our images of the same data produced using the MCIDAS software package (figs. 1B-D and F-H), the rising center of the cloud varies slightly in position relative to Pinatubo's vent, suggesting that the vent-derived plinian eruption column and giant umbrella cloud were augmented later in the event by co-ignimbrite ash columns lifting off the pyroclastic flows to the west and south of the volcano. In fact, plinian and pyroclastic flow activity were probably concomitant during much of the climactic phase (W.E. Scott and others, this volume). Model calculations show that the width of point-source plinian eruption columns near the top is about twice the height for columns >30 km high (Wilson and Walker, 1987), so that a mean column height of 35 km would be predicted to have an umbrella region about 70 km wide. Because the Pinatubo umbrella cloud reached >500 km in diameter by 1640, a larger surface area for the plume source is indicated such as would be provided by the central vent and surrounding pyroclastic flows (Woods and Wohletz, 1991). Although it is recognized that perhaps 90% of the erupted volume was produced in the 9-h climax, infrasonic records from Japan (fig. 6 in Tahira and others, this volume) and barometric records collected near Pinatubo identify a 3-h period from about 1340 to 1640 during which the output and, by inference, the mass eruption rate were the highest. This period is covered by figure 1 and shows the development of the remarkable umbrella cloud that reached 550 km in diameter east to west by 1640 and pushed up to 250 km upwind at an average expansion rate of 20 m/s with a maximum average expansion of the plume between 1420 and 1440 of 125 m/s (Koyaguchi and Tokuno, 1993). The giant umbrella cloud covered an area of 300,000 km2 at 1940 and was sustained and growing during the whole 9-h climax, eventually reaching >1,100 km in diameter. Several studies of available satellite images estimated the top of the umbrella cloud to be at least 35 km during the climax (Koyaguchi and Tokuno, 1993; Lynch and Stephens, this volume). This value is corroborated here by measurement of cloud-top temperature on both NOAA Advanced Very High Resolution Radiometer (AVHRR) and GMS thermal infrared (IR) images, taking into account that the central area of the umbrella cloud around the rising column can potentially suffer brief but dramatic undercooling (Woods and Self, 1992). That area had wildly varying temperatures (fig. 1E-H), and, therefore, temperatures were determined on a high-level portion of the umbrella cloud away from this central zone. The instrument-perceived plume-top temperatures were compared with an atmospheric temperature profile for the same period (fig. 2). Values indicate a middle-stratospheric height for the average cloud top (34-37 km), if it is assumed that the cloud is in the stratosphere. The assumption is based on the fact that the umbrella region casts shadows in the visible images on the tropospheric clouds associated with Typhoon Yunya. Holasek (1995) compared several thermal-IR image altitudes with shadow-determined plume heights in visible-IR images indicates that the overshooting top of the eruption column was higher than this, perhaps exceeding 40 km. Height determinations by the shadow method on the main umbrella cloud also agree with these values, giving an altitude of 25 km at the eastern edge and 34 km at its center for the 1540 image (Tanaka and others, 1991). Thus, the umbrella cloud probably occupied a 10-15-km-thick section of the atmosphere from the tropopause to 35 km for a period in excess of 12 h. As the cloud subsided and entered higher wind fields at lower altitudes, GMS satellite images of the entrained plume shows that it covered an area of 2.7x106 km2 36 h after the eruption, a size unprecedented in recent times. Figure 2. 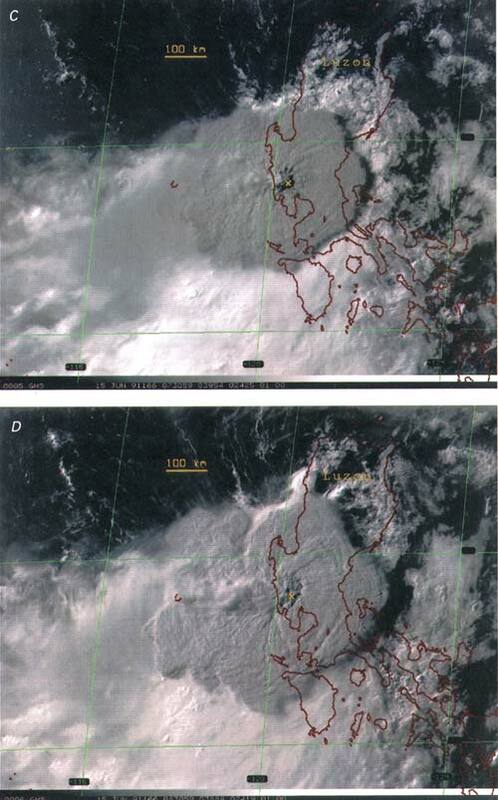 Temperatures retrieved from AVHRR thermal-IR and GMS weather satellite images of the relatively warm ash plume blowing westward off the overshooting top of the Pinatubo umbrella cloud indicate approximate altitude by comparison with National Meteorological Center grid point data for temperatures over the Philippines. GMS data collected at 1541 (1530 image; see fig. 1G) indicate 37 km in altitude and AVHRR data at 1834 indicate 34 km in altitude. The main ash cloud was transported by the prevailing winds from the east-northeast, probably at levels in the middle stratosphere down to the upper troposphere, typical of tropical circulation at that time of year in the easterly phase of the quasibiennial oscillation, and much of the ash fell at sea where no data were recovered (fig. 3A). The ash cloud could be clearly tracked on GMS weather satellite images until June 17, after which sufficient ash must have fallen out to make the plume hard to define. Movement of the volcanic cloud after this time, as tracked by the SO2 cloud, could then be followed on Total Ozone Mapping Spectrometer (TOMS) satellite images (fig. 3B) and by aerosol determinations from the AVHRR (Lynch and Stephens, this volume) and Stratospheric Aerosol and Gas Experiment (SAGE) II (McCormick and Veiga, 1992). The circumglobal transport of the developing aerosol cloud is discussed in a following section. After the climactic phase, eruption columns from Pinatubo explosions reached upper tropospheric to lower stratospheric altitudes on several occasions. Some ash columns associated with secondary pyroclastic flows (Torres and others, this volume) even occurred in 1993. However, these were all of insignificant size compared to the main eruption and did not approach the atmospheric impact of the main eruption, except, perhaps, to pose a threat to aircraft. During the climactic phase of the Pinatubo eruption on June 15, large amounts of volcanic SO2 and other gases that were released into the atmosphere rapidly produced a large increase in the sulfate aerosol loading of the stratosphere. The TOMS satellite measured the largest SO2 cloud ever detected during the instrument's 13 years of operation, 20 (±6) megatons (1 Mt = 109 kg) of SO2, almost all from the 9-h climax (Bluth and others, 1992). The estimate is based on a TOMS measurement of 18.5 Mt about 36 h after the eruption ended, combined with an observed average decrease in SO2 in the cloud of 1 to 1.5 Mt per day. We note that TOMS measurements may be subject to errors of about 30% (A. Krueger, personal commun., 1993). The stratospheric cloud was observed by TOMS to encircle the Earth in about 22 days (fig. 3B). Other estimates of the amount of SO2 released from remote sensing data were made from the Microwave Limb Sounder (MLS) on the Upper Atmosphere Research Satellite (UARS), which made its first measurements on September 12, 1991 (Read and others, 1993), and from the spectral scan data of the SBUV-2 instrument on the NOAA-11 satellite (McPeters, 1993) (fig. 4). The initial masses indicated are 17 and 13.5 ±1.5 Mt, respectively, giving an average when combined with the TOMS figure of 17 ±~2 Mt (see also Gerlach and others, this volume). The initial mass of the injection may have been greater than the estimates obtained by extrapolation of the remotely sensed data, because some unknown amount of sulfur was probably scrubbed out of the atmosphere by the falling silicate ash particles. However, the lower estimates of SO2 above are in better agreement with the measured maximum aerosol masses, as will be shown subsequently in the text. The origin of this large amount of SO2 was probably from a water-rich, sulfur-bearing fluid phase coexisting with the dacitic Pinatubo magma (Gerlach and others, this volume; see also several other papers in this volume for discussion of the origin of the erupted sulfur). The Gerlach study shows convincingly that the dissolved sulfur contained in the >5-km3 magma body before eruption, as estimated by the petrologic method (Devine and others, 1984), was insufficient to account for the SO2 cloud. Thus, in the Pinatubo case (Hattori, 1993; this volume), and in other eruptions of evolved magmas developed under highly oxidizing conditions, such as with El Chichón, Mexico, in 1982 (Luhr and others, 1984), the erupted magma volume bears little, if any, relation to the size of the volatile release, as discussed in more detail by Gerlach and others (this volume). As well as sulfur, CO2, H2O, and a small amount of chlorine were released to the stratosphere (Gerlach and others, this volume), and some of the water may have been important in early formation of aerosols. Electron microprobe analyses of glass inclusions and matrix glass in Pinatubo dacitic pumice suggests that up to 4.4 wt% H2O was exsolved from the magma to a gas phase, implying the release of about 250 to 500 Mt of H2O during the June 15 eruption (Westrich and Gerlach, 1992; Gerlach and others, this volume). Although 3 Mt of chlorine was erupted (Gerlach and others, this volume) and was potentially available for subsequent participation in ozone-destroying reactions (Turco, 1991), observations by airborne infrared Fourier transform spectrometry of the stratospheric cloud 3 weeks after the June 15 eruption showed little increase in HCl above stratospheric background levels (Mankin and others, 1992; Wallace and Livingston, 1992). Erupted chlorine, as HCl, is highly soluble in water and is very efficiently scavenged by water droplets in the eruption column and rapidly returned to the surface of the Earth as precipitation (Tabazadeh and Turco, 1993). Much of the chlorine may have thus been removed from the atmosphere during or shortly after eruption. The large Pinatubo stratospheric SO2 cloud began to spread rapidly and oxidize to form stratospheric sulfuric acid aerosols. Approximately half of the SO2 had been converted to sulfuric acid aerosols by 21 to 28 days after the eruption (Winker and Osborn, 1992a). The MLS on the UARS satellite detected minor amounts of unoxidized SO2 for up to 170 days after the eruption. Accordingly, the average conversion rate of SO2 is about 33 days (Read and others, 1993). Multiwavelength stratospheric aerosol extinction measurements from the SAGE II and airborne and ground-based photometers revealed greatly increased extinction with an initial wavelength dependence indicating the presence of very small aerosols created by gas-to-particle conversion (Thomason, 1992; Valero and Pilewskie, 1992; Russell and others, 1993b; Dutton and others, 1994). These newly formed aerosols grew to larger sizes by condensation of sulfuric acid and water vapor and by the coagulation process (Russell and others, 1993a,b; Dutton and others, 1994), leading to optical depth spectra that peaked at midvisible ( ~0.5 m) or longer wavelength, starting about 2 months after the eruption. Over 90% of the particles collected from the volcanic clouds were composed of H2SO4/H2O solution (Deshler and others, 1992b). The typical size of volcanic aerosols observed after several months of the eruption was in the range of 0.3 to 0.5 m (Deshler and others, 1992a, 1993; Pueschel and others, 1992; Asano, 1993; Asano and others, 1993). Numerical modeling has reproduced the observed microstructure and optical properties of the Pinatubo aerosols during the period of the formation and growth in the stratosphere (Zhao and others, unpub. data, 1994). About 20 to 30 Mt of new aerosol produced by the Pinatubo eruption was estimated by use of SAGE II data (McCormick and Veiga, 1992). The mean mass, about 25 Mt of sulfate aerosol, requires that only 13 Mt of SO2 is available to form it, if it is assumed that the aerosols are 75 wt% H2SO4 and 25 wt% H2O (Hamill and others, 1977). This estimate is somewhat smaller than those of SO2 release given in figure 4. Infrared absorption by the Pinatubo aerosol also suggests that the composition is 59 to 77% H2SO4, the remainder being water (Grainger and others, 1993). 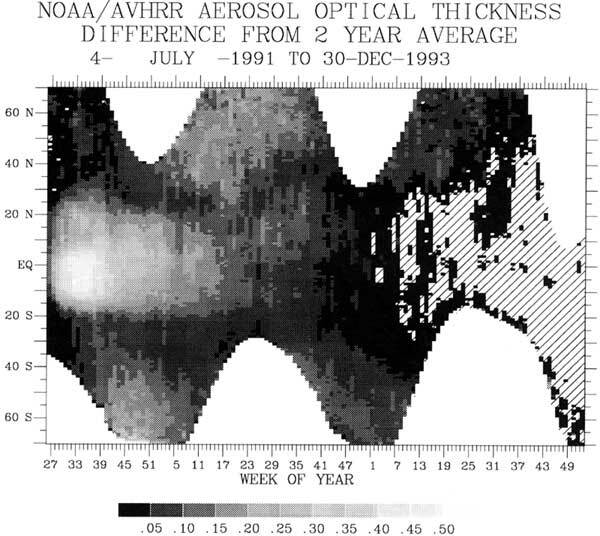 Optical depth from SAGE II satellite measurements and NOAA/NESDIS aerosol optical thicknesses (AOT) derived from reflected solar radiation measurements of the AVHRR instrument on board the NOAA-11 polar orbiting satellite revealed that the Pinatubo aerosol layer circled the Earth in 21 days and had spread to 30°N. lat and about 10°S. lat in the same period (McCormick and Veiga, 1992; Stowe and others, 1992). It had covered 42% of the Earth's surface by mid-August 1991 (fig. 5), with the aerosol cloud at that time having a maximum mean midvisible optical thickness of 0.3 (Stowe and others, 1992). Optical depth or thickness ( ) is defined as the natural logarithm of the ratio of incident to transmitted direct beam radiation of wavelength , assuming vertical incidence. Figure 5. Dispersal of Pinatubo aerosols between July 4, 1991, and December 30, 1993, shown by time series of one degree zonally averaged optical thickness (depth) departures following the Mount Pinatubo eruption. The departures are computed from the 2-year weekly mean values observed before the eruption. Derived from AVHRR NOAA-11 satellite data, after Long and Stowe (1994). The plot is made from intensity measurements of reflected solar radiation by the AVHRR. Note Mount Hudson (Chile) aerosol cloud from 40° S. to 60° S. lat beginning week 39. Local aerosol optical depths exceeding = 0.4 were measured in July 1991 by an aircraft-borne radiometer over the Caribbean region (Valero and Pilewskie, 1992). Average monthly dispersion rates of the aerosol cloud in the Northern Hemisphere were measured at 5° of latitude per month (Nardi and others, 1993). Pittock (1992) reported the first arrival of the aerosol cloud over Melbourne (37°45' S. lat) on July 19, 1991. The slow poleward dispersal of the aerosol in the first 10 months can be considered as a series of detrainment events from a tropical reservoir (Trepte and others, 1993). 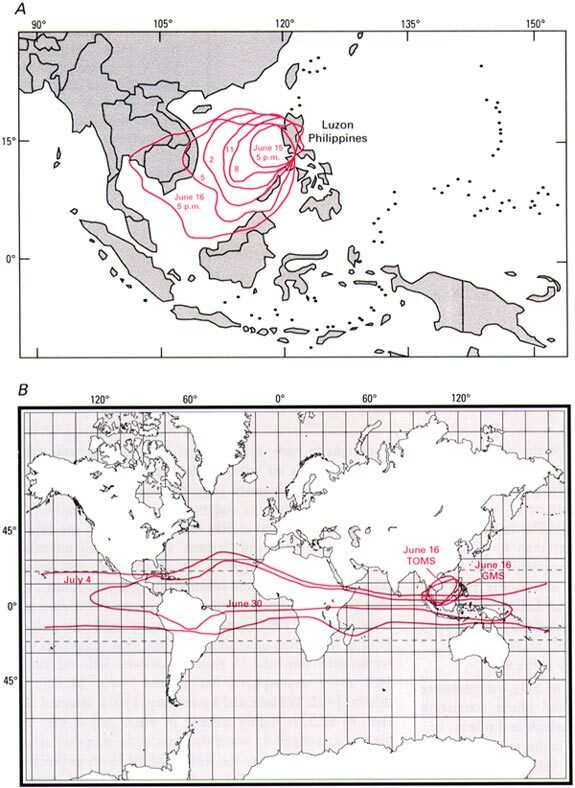 Rosen and others (1992) noted localized fast meridional spreading of the lower part of the aerosol cloud into the northern part of the Northern Hemisphere at 20 km in altitude by October 1991. Trepte and Hitchman (1992) suggest that one reason why the bulk of the aerosol cloud was slow to penetrate to northern latitudes, thereby increasing the lifetime of the dense aerosol over tropical latitudes, was because it was high in the middle stratosphere above the zone affected by the quasibiennial oscillatory easterly shear that transports tropical aerosols polewards. By 1 year after the eruption, the aerosols had covered almost the entire globe, and the concentration has been decreasing exponentially since then. The background aerosol concentration in the stratosphere has not been reached in the more than 3 years since the eruption. SAGE II satellite data provide an overview of the profound changes to the atmospheric aerosol loadings following the eruption (fig. 6). Figure 6. Integrated SAGE II stratospheric optical depth at wavelength 1,020 nm for four periods just preceding and following the eruption of Mount Pinatubo. 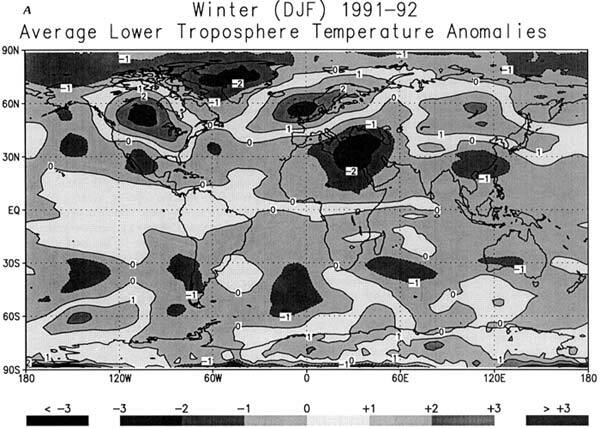 The stratospheric opacity during the April 10 through May 13, 1991, period was at near-background levels. 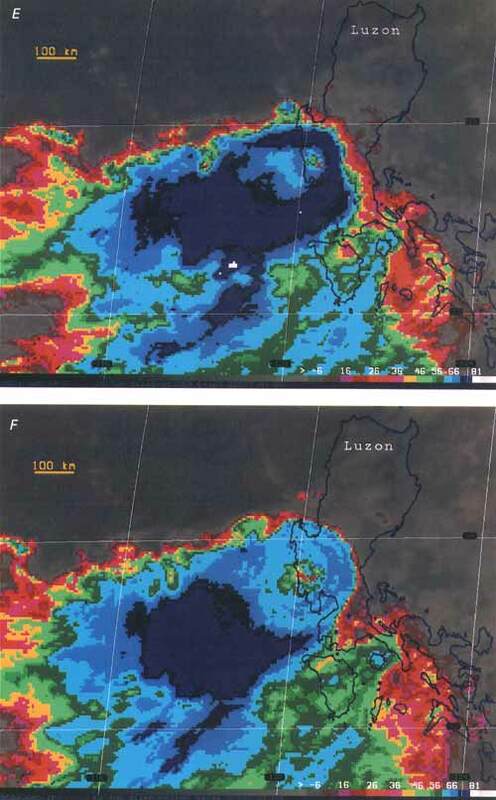 The data from June 15 through July 25, 1991, show the tropical confinement of the Mount Pinatubo aerosol and the approximately two orders of magnitude increase in the 1- m optical depth. Some indications of the initial transport to middle and high latitudes are also evident at this time. Later that year, SAGE II measurements showed that significant increases were occurring in middle and high latitudes and, by early 1992, the stratospheric optical depth was at or exceeded 0.1 at all latitudes. The figure for December 5, 1993, through January 16, 1994, shows the result of the gradual removal of aerosol from the stratosphere. While the optical depth has decreased by approximately an order of magnitude by this time, it is also evident that the stratospheric optical depth was still dominated by volcanically derived aerosol. Between June and August 1991, SAGE II and AVHRR-derived measurements indicated an aerosol layer located primarily between 20 and 25 km in altitude and between 10°S. to 20°N. lat (McCormick and Veiga, 1992; Long and Stowe, 1994), increasing the stratospheric aerosol loading by two orders of magnitude over preeruption Pinatubo values (fig. 6). Enhanced aerosol concentration to altitudes above 35 km are consistent with estimated eruption column heights. Dustsonde measurements over the mid-North American continent (Deshler and others, 1992b) show that the early volcanic cloud was between 20 and 30 km in altitude, with a double layer structure during the early period (fig. 7) that merged into a single layer in August 1991. The two layers of aerosol can be seen in figure 7, a photograph of the atmosphere over South America taken by space shuttle astronauts in early August 1991. Figure 7. Space Shuttle (Mission STS 43) photograph of the Earth over South America taken on August 8, 1991, showing double layer of Pinatubo aerosol cloud (dark streaks) above high cumulonimbus tops. Lidar studies showed that, in July, aerosols were at 17 to 26 km in altitude near Barbados (Winker and Osborn, 1992b), 21 to 23 km over Hawaii (DeFoor and others, 1992), 15 to 20 km over Germany (Jäger, 1992), and 15 to 16 km in the upper troposphere to lower stratosphere over Colorado (Post and others, 1992). In late August another aerosol layer was seen at 25 km over Colorado and at 20 to 25 km over Germany. This two-tiered aerosol layer has been monitored after other tropical eruptions (Trepte and others, 1993) and corresponds to typical transport patterns at mid-latitudes in summer, with westerlies below 20 km and easterlies above. The Pinatubo aerosol cloud persisted for 3 years at concentration levels well above the preeruption background in the Northern Hemisphere (Dutton and others, 1992) as a result of its original high density. The increase in decay rates of the aerosol cloud depends strongly on location. An e-folding time (time to decay to 1/e of the original optical depth) of over 13 months was estimated near the Arctic (Stone and others, 1993), which is slightly longer than for most volcanic aerosol events. SAGE II measurements and analysis (McCormick and others, in press) yield peak surface areas of >50 m2/cm3 and peak mass mixing ratios of 300 ppbm (parts per billion by mass). The aerosol mass and surface area observed at Laramie were greatly increased after the arrival of the volcanic cloud (fig. 8; Deshler and others, 1993). The sulfuric acid aerosol surface area and mass had maximum values of 40 m2/cm3 and 160 ppbm, respectively, approximately 180 days after the eruption and still remained an order of magnitude higher than ambient levels for at least 2 years after the eruption. Such a great enhancement in aerosol mass and surface area due to the eruption produced significant variations of atmospheric optical properties and ozone abundance. The time series of optical depths (at 0.5 m) from AVHRR measurements show the time lags of maximum values at different latitudes, depending on the lateral spreading rates of volcanic clouds (Long and Stowe, 1994). In the tropical region between 20°S. and 30°N. lat, the average optical depth reached its peak value of 0.3 to 0.4 about 3 months after the eruption and then gradually decayed afterward with a slight seasonal variation. Because the volcanic cloud spread to the Southern Hemisphere faster than to the Northern Hemisphere, the maximum optical depths in northern middle latitudes appears 6 months later than in the Southern Hemisphere. The widespread dispersal of the aerosol into both hemispheres led to many optical effects such as unusual colored sunrises and sunsets, crepuscular rays, and a hazy, whitish appearance of the sun. These were experienced in Hawaii for much of late 1991, through most of 1992, and, after a lull in the fall of 1992, returned in the early months of 1993, finally dying away in about August. In the months following the Pinatubo eruption optical depth increases of the stratosphere were the highest ever measured by modern techniques, in the order of 0.3 to 0.4 (Stowe and others, 1992; Valero and Pilewskie, 1992). Optical depths remained high, above 0.1, in 1992 (fig. 6), and the decrease in incident radiation, as measured by atmospheric transmission at Mauna Loa Observatory, gradually grew smaller toward 1993 (see fig. 10) (Dutton and others, 1992). Optical depths (at = 0.55 m) of 0.2 were measured at 6°S. lat 5 months after the eruption (Saunders, 1993) and as high as 0.22 in high northern latitudes 6 months after the eruption but were only 0.08 at 18° to 20°S. lat at about the same time (Russell and others, 1993a; Stone and others, 1993). One year after the eruption, was measured at 0.1 at 53°N. lat (Ansmann and others, 1993). The global average optical depth probably peaked at about 0.15 in early 1992, consistent with a total global aerosol at that time of about 20 Mt (Rosen and others, 1994). Optical depths have remained at higher values above background for a longer period following Pinatubo than following El Chichón and are expected to take more than 4 years to reach background levels (Dutton and Christy, 1992). A chronology of radiation changes at Mauna Loa Observatory after both the Pinatubo and El Chichón events (fig. 9, inset) shows that the 1982 perturbation was slightly greater at that site but that the effect decayed faster than the 1991-92 event. The reason that more sudden and large increases in were seen from the overall smaller aerosol loading from El Chichón is that the young El Chichón cloud passed directly over the observatory, whereas Pinatubo aerosols had dispersed and settled out of stratosphere somewhat before the cloud passed 22°N. lat. The pattern of the trends through the posteruption years at Mauna Loa Observatory is quite similar, reflecting similar decay histories of the two clouds at that latitude. In July 1993, (0.5 m) was still 0.02 at Mauna Loa (background = 0.003), about the same as the peak value recorded there after the passage of the Northern Hemisphere portion of the aerosol cloud from the Agung eruption of 1963 (E.G. Dutton, NOAA, CMDL, oral commun., 1993). At most locations, maximum local values of after Pinatubo equaled or exceeded those after El Chichón. The much bigger aerosol mass loading from Pinatubo caused a radiative perturbation to the whole climate system about 1.7 times larger than that of El Chichón (Dutton and Christy, 1992). It is worth noting that up to the time of writing no studies had been published of radiative properties of the fine silicate dust in the atmosphere due to this eruption or of its role in aerosol-forming processes. Even though it had a shorter residence time than the sulfate aerosols, it may have had a significant effect. Depolarization of airborne lidar data shows that uneven-shaped particles, perhaps ash, were present in the lower part of the aerosol cloud up to 7 to 9 months after the eruption (L.R. Poole, NASA, LARC, oral commun., 1993). Aircraft impactor data also show the coated silicate particles just above the tropopause through March 1992 (Pueschel and others, 1992). Radiative forcing of the climate system by stratospheric aerosols depends on the geographic distribution, altitude, size distribution, and optical depth of the aerosols, but tropospheric temperatures are most strongly dependent on the total optical depth (Lacis and others, 1992). The optically dense Pinatubo aerosol cloud caused marked changes in the amount of radiation reaching the Earth's surface; in turn, these changes affected weather and climate over the past 3 years following the eruption. As observed after several eruptions, including Agung in 1963 and El Chichón in 1982, stratospheric warming and lower tropospheric and surface cooling have been documented after the Pinatubo eruption. Labitzke and McCormick (1992) show that warming in the lower stratosphere (16 to 24 km or 30 to 100 mbar) of up to 2 to 3°C occurred within 4 to 5 months of the eruption between the equator and 20°N. lat., and it was also later noticed in middle northern latitudes (Angell, 1993). The warming distribution closely mirrored the dispersal pattern of the aerosol cloud; this mirroring strongly suggests that the warming was due to absorption of radiation by the aerosols. The warming was more intense in southern temperate-polar latitudes, perhaps due to the presence of aerosols from the Mount Hudson eruption. Such temperature changes can influence stratospheric dynamics (Pitari, 1992). Since the peak of stratospheric warming in late 1991, temperatures in the 18- to 24-km region have cooled considerably, passing the average in early 1993 (fig. 10); temperatures in 1993 were the coldest ever recorded (Christy and Drouilhet, 1994; Monastersky, 1994) and may be related to ozone destruction in the lower stratosphere. Stratospheric temperatures also plummeted and stayed cooler than average for 7 years after the El Chichón eruption. Figure 10. Lower stratospheric temperature anomalies from the microwave sounding unit (MSU) channel 4 for the globe 85°S. lat to 85°N. lat. Anomalies are computed from the 1982 to 1991 base period. (After Christy and Drouilhet, 1994). Several experiments have measured the radiative climate forcing of the Pinatubo aerosols. The NASA Earth Radiation Budget Experiment (ERBE) recently provided the first unambiguous direct measurement of the climate forcing on a large scale in both hemispheres (Minnis and others, 1993), an average radiative cooling of 2.7 W/m2 by August of 1991. Direct solar beam reductions of 25 to 30% were measured at widely distributed stations by Dutton and Christy (1992), while Stowe and others (1992) showed from AVHRR-derived optical depth measurements that the globally averaged net radiation at the top of the atmosphere may have decreased by about 2.5 W/m2 in late 1991. These values translate into a global cooling of at least 0.5 to 0.7°C, as seen in the global and Northern Hemisphere temperature records by September 1992 (Dutton and Christy, 1992). A net cooling effect of approximately 0.3°C was estimated as a result of the El Chichón aerosol (Angell and Korshover, 1983; Handler, 1989), but the overall potential cooling caused by the El Chichón cloud was moderated by warming associated with El Niño-Southern Oscillation (Angell, 1988, 1990). Pinatubo had a much larger radiative influence than El Chichón in the Southern Hemisphere (Dutton and Christy, 1992). Pinatubo's cloud caused about 1.7 times the global radiative forcing of El Chichón, making the estimated cooling of 0.5°C a more robust figure. One possible opposite effect, leading to surface warming, may have been caused by stratospheric to tropospheric transport of aerosols, due to aerosol-induced changes in atmospheric dynamics, and in a theoretical study Jensen and Toon (1992) suggest that this process may cause higher than usual amounts of cirrus clouds in the upper troposphere. Warmer than average winters and cooler than average summers over continental Northern Hemisphere areas have been documented and modeled after several eruptions, including Pinatubo (fig. 11; Robock and Mao, 1992; Graf and others, 1993), and this appears to be part of the normal Northern Hemisphere response after volcanic aerosol events (Groisman, 1992; Robock and Liu, 1994). Figure 11. Winter (December, January, February) 1991-92 (A) and summer (June, July, August) 1992 (B) temperature anomalies (departures from long-term means) in degrees Celsius, demonstrating the Pinatubo-induced winter warming and summer cooling over Northern Hemisphere continental areas. Data are a combination of satellite atmospheric temperature determinations by J. Christy, University of Alabama, Huntsville, and surface temperature data from P.R. Jones, University of East Anglia, U.K. Plots courtesy of A. Robock, University of Maryland. Analysis of surface temperatures or weather patterns postdating Pinatubo's eruption are still underway because of the short time elapsed since the presence of the Pinatubo aerosol, but a great deal of attention has been focused on modeling of the potential climatic impact of the eruption. The interest is in Pinatubo as a natural experiment and climatic perturbation--what changes in surface temperature and circulation a large volcanic aerosol event can bring about--and also as a validation for climate models. Can the models predict realistic climate changes, and could eruption-induced cooling offset greenhouse-induced global warming? With a three-dimensional global circulation model, Hansen and others (1992) were able to predict the global cooling in 1991-1993 (fig. 12A) and then check their results against real surface-temperature trends. Using a forcing in the model equivalent to a global mean of about 0.15 based on conditions appropriate for the Pinatubo aerosol cloud yielded a model radiative forcing at the tropopause of -4 W/m2. Hansen and others (1993) show observed maximum average coolings of up to 0.6°C by late 1992 over high-latitude land masses, and less elsewhere (fig. 12B), in agreement with the modeled coolings. It should be noted that temperature data plotted in figure 12 are dominantly from stations on land. Figure 12A. Observed and modeled monthly temperature change of stratosphere, troposphere, and surface after the Mount Pinatubo eruption. Stratospheric observations are 30-mbar zonal mean temperature at 10° S. lat; model results are 10- to 70-mbar layer at 8° to 16° S. lat. Other results are essentially global, with observed surface temperature derived from a network of meteorological stations. Base period for tropospheric temperatures is 1978-92, while troposphere and surface are referenced to the 12 months preceding the Pinatubo eruption, the latter marked by a vertical dashed line. Figure 12B. 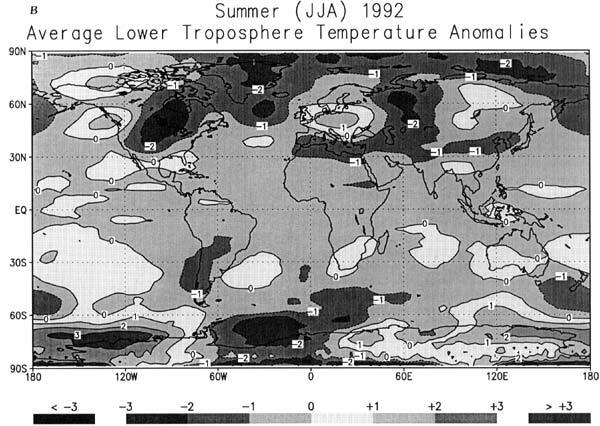 Model cooling predicted for 1991-92 (Hansen and others, 1993) shown by observed model air temperature anomalies relative to the 1951-80 mean for Northern Hemisphere summers of 1991 and 1992. Figures courtesy of James Hansen and Helene Wilson, NASA Goddard Institute for Space Studies, after Hansen and others (1993). Other attempts to evaluate the climatic response to the Pinatubo aerosol include comparison with the global temperature record of the University of East Anglia, which includes surface air temperature over land and sea (Robock and Mao, 1994), and on Southern Hemisphere sea surface temperatures (Walsh and Pittock, 1992). These studies shows that the temperature anomaly after Pinatubo is about 0.4 to 0.6 K cooler than average over a large part of the Earth (fig. 13). Figure 13. Latitude band anomalies in temperature (Kelvin) plotted with respect to the 5-year mean before the Pinatubo eruption. Data are surface temperature for land-based stations combined with sea surface temperatures, from P.R. Jones (University of East Anglia, U.K.). Year 0 is the eruption year; precise time of eruption indicated at bottom of each graph. Data and diagram courtesy of A. Robock, University of Maryland, from Robock and Mao (1995). The superimposition of Pinatubo's aerosol-induced climatic effects on long- and short-term variable trends, such as El Niño-Southern Oscillation and "greenhouse" warming, has led to much discussion as to the cooling effects on the current warming trend. Global temperature trends show a gradual, unsteady rise from the mid-1970's to the mid-1980's (Hansen and Lebedeff, 1987), perhaps due to forcing by greenhouse gases, and continuation of this rise had led to claims of record high temperatures in the early 1990's (see Bassett and Lin, 1993; Hansen and Wilson, 1993). However, the cooling since Pinatubo's eruption has offset the warming trend considerably, such that cooler than normal conditions dominate the Northern Hemisphere (Mo and Wang, 1994). The Pinatubo aerosol cloud was, like with El Chichón, coincident with sudden warming due to an El Niño event, but this warming event was not nearly as strong as in the El Chichón case. El Niño may have provided a warming of about 0.2°C, partially offsetting the Pinatubo-induced cooling in the tropics, but modeling suggests a coincidence rather than a cause and effect relation between eruptions and El Niño (Robock and Liu, 1994). The Pinatubo climate forcing is stronger than the opposite, warming effect of the El Niño event or anthropogenic greenhouse gases. The predicted and observed Pinatubo climatic cooling resulted in noticeable changes in the local climate and weather. For example, in 1992, the United States had its third coldest and third wettest summer in 77 years. Floods along the Mississippi River in the summer of 1993 and drought in the Sahel area of Africa may be attributable to climatic shifts caused by the Pinatubo aerosols and aerosol-induced temperature changes (Mo and Wang, 1994; Robock and Liu, 1994). Moreover, the cooling is not spatially uniform, as underlined by the several recent models mentioned above, and many areas have suffered above-average warm conditions such as the 1991 and 1992 winters in Eurasia. 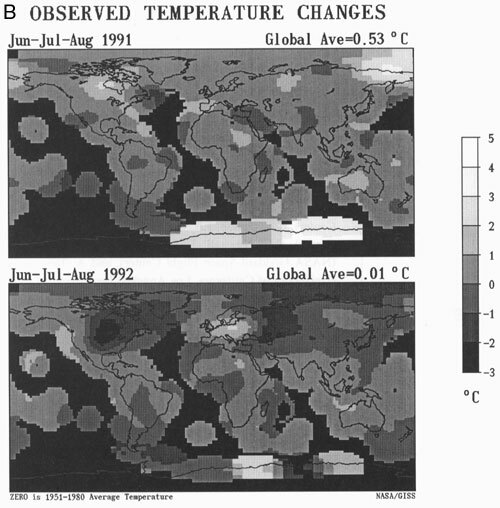 Model results (Hansen and others, 1993) show that global circulation model runs do, for various plausible scenarios, predict actual temperature changes to date (fig. 12A). Exactly for how long the Pinatubo-induced cooling will manifest itself as changing surface or regional climate and weather patterns remains to be seen and will be documented in future years. Sulfate aerosols in the stratosphere can catalyze heterogeneous reactions that affect global ozone abundance (Farman and others, 1985; Hofmann and Solomon, 1989; Wolff and Mulvaney, 1991; Prather, 1992). These heterogeneous processes occurring on the surface of sulfate particles can convert stable chlorine reservoirs (such as HCl and ClONO2) into photochemically active chlorine species (Cl2, ClNO2, HOCl) that are active in ozone destruction (Hofmann and Solomon, 1989; Solomon and others, 1993). Increase in aerosol surface area due to the Pinatubo volcanic eruption has had a considerable effect on global ozone (Bhartia and others, 1993; Deshler and others, 1992b; Gleason and others, 1993; Grant and others, 1992; Hofmann and Oltmans, 1993; Hofmann and others, 1994a,b; Schoeberl and others, 1993; Weaver and others, 1993). For example, reduced ozone concentrations with peak decreases as large as 20% at 16 to 25 km in altitude were found in the tropical stratosphere 3 to 6 months after the Pinatubo eruption (Grant and others, 1992). Up to 6% reduction of equatorial total ozone was observed by TOMS measurements following the eruption of Pinatubo (Schoeberl and others, 1993). At the time of maximum aerosol development, up to 20% depletion in ozone was measured over Colorado and Hawaii (Hofmann and others, 1993; 1994a), and mid-latitude ozone abundance reached its lowest level on record during 1992-93. The total ozone amount was 2 to 3% lower than in any earlier year, with the largest decreases in the regions from 10° S. to 20 S. lat and 10° N. to 60° N. lat (Gleason and others, 1993). Startling decreases in ozone abundance and in rates of ozone destruction were also observed over Antarctica in 1991 and 1992. This ozone decrease may be due in part to the presence of Pinatubo aerosols but also to the extra aerosol injection from the Mount Hudson eruption in Chile during August 1991 (Doiron and others, 1991; Barton and others, 1992). A sharp decrease in ozone at 9 to 11 km in altitude (approximately at the tropopause) in the austral spring of 1991 was noted at the time of arrival of the Pinatubo and Mount Hudson aerosols (Deshler and others, 1992a). The Southern Hemisphere "ozone hole" increased in 1992 to an unprecedented 27x106 km2 in size, and depletion rates were observed to be faster than ever before recorded (Brasseur, 1992; Hofmann and others, 1992; 1994b). In late 1992, weather patterns caused a shift in the polar vortex, and warm ozone-rich tropical air entered the Antarctic atmosphere to partially halt the ozone depletion. Ozone depletion causes an enhancement in the amount of biologically destructive ultraviolet radiation that reaches the Earth's surface (Smith and others, 1992; Vogelmann and others, 1992). Although the Pinatubo eruption was probably not of sufficient magnitude to cause large decreases in ozone over wide regions (2 to 4% decrease is average), much larger past eruptions (for example, Tambora, Indonesia, in 1815), with an estimated aerosol mass 5 to 10 times that of Pinatubo, may have caused drastic increases in the amount of harmful ultraviolet radiation at the Earth's surface. The 1991 Pinatubo eruption, about 5 km3 DRE, could well be the second largest this century, after Katmai-Novarupta, Alaska, in 1912. It is slightly bigger than either the plinian eruption of Santa María, Guatemala, in 1902 or the 4 km3 DRE plinian eruption of Cerro Azul, Chile, in 1932 (Hildreth and Drake, 1992). For Santa María, Fierstein and Nathenson (1992) suggest a smaller volume, about 4 to 5 km3 DRE, than the 9 km3 proposed by Williams and Self (1983). Aerosols derived from Katmai-Novarupta, which produced about 13 km3 DRE (Fierstein and Hildreth, 1992), also caused diminution of solar transmission by about 20% at locations north of about 40° N. lat (Kimball, 1918, 1924), but the aerosols did not have widespread climatic influence, because they were contained in northern latitudes (Arctowski, 1915). Although it is not known with certainty, the 1912 eruption may have yielded a smaller amount of SO2 and therefore caused a lower aerosol loading. Estimated optical depths after 1912 for the 30°to 90° latitude zone are only 0.1 or less (Sato and others, 1993). Pinatubo is also much larger in terms of volume erupted than the other notable eruptions of this century that have caused atmospheric perturbations--for example, Agung in 1963 and El Chichón in 1982, both of which erupted about 0.5 km3 of magma (Self and King, 1993). However, as the Pinatubo event has shown, magma volume erupted and amount of SO2 released are not always proportional to each other. The small El Chichón eruption yielded just less than half of the amount of SO2 released by Pinatubo (7-8 Mt; Varekamp, 1984) and generated just less than half the amount of aerosol (McCormick and others, in press), but the magma volume erupted was an order of magnitude smaller than Pinatubo's. The relative size and duration of the Pinatubo aerosol perturbation compared to that after El Chichón can be seen on the integrated aerosol backscatter record from Langley, Research Center, Hampton, Va., USA (37.1° N.) (fig. 14); these two events dominate stratospheric loading and chemistry over the past two decades. The peak values after Pinatubo are less than expected because of the delayed spread of the aerosol to these latitudes, while the El Chichón cloud was still near its peak density when it passed over this area. Figure 14. Integrated aerosol backscatter measurements from the tropopause to 30 km obtained by lidar at Hampton, Va. (37° N. lat, 76° W. long), at a wavelength of 694 nm since 1974. The major volcanic eruptions that increased Northern Hemispheric mid-latitude aerosol loading are noted by arrows on the time axis. Data courtesy of M. Osborn and M. P. McCormick, NASA Langley Research Center. Certainly, in terms of widespread impact, due to its equatorial location, the early summer date of eruption, and the resulting global spread of the aerosol cloud, the Pinatubo aerosol cloud that enveloped the Earth from the end of June 1991 to late 1993 is the largest since that caused by the approximately 10-km3 DRE Krakatau eruption in late August 1883, which also produced an aerosol veil of global extent. In fact, the maximum 20- to 30-Mt Pinatubo stratospheric aerosol loading may not be that much smaller than Krakatau's, variously estimated at between 30 and 50 Mt (Rampino and Self, 1982, 1984). This conclusion is consistent with estimated global aerosol midvisible optical depths for Krakatau, which were 0.14 in late 1884 to early 1885 (Sato and others, 1993; fig. 15). This value is for the Krakatau aerosol layer after more than 1 year's dispersal, and, presumably, much sedimentation of particles, and peak optical depths may have been considerably larger. The global optical depth is equivalent to a global aerosol loading of about 25 Mt, on the basis of the relationship of Stothers (1984a), similar to that of the Pinatubo peak loading. Both Pinatubo and Krakatau, however, are dwarfed by the eruption of Tambora in 1815, both in volume erupted (50 km3) and the peak optical depth attained by the widespread aerosol cloud, estimated to be >1.0 in northern latitudes 6 months after the eruption (Stothers, 1984b). Figure 15. Estimated global stratospheric optical depth at = 0.55 µm for the period 1850 to 1993, after Sato and others (1993). Most peaks are the result of instantaneous volcanic injections of SO2 into the stratosphere and subsequent rapid formation and monotonic decline of sulfate aerosols. The 1991 eruption of Pinatubo, culminating in a 9-h climactic plinian and pyroclastic-flow-producing phase on June 15, produced about 5 km3 of dacitic magma and is the second largest volcanic eruption of the century in terms of magnitude (volume of magma produced). Eruption columns rising above the vent and off the pyroclastic flows reached in excess of 35 km in altitude and emplaced a giant umbrella cloud in the middle to lower stratosphere that attained a maximum dimension of over 1,100 km in diameter. This cloud injected about 17 Mt of SO2 into the stratosphere (twice the amount produced by the 1982 El Chichón eruption), and this SO2 immediately began to convert into H2SO4 aerosols, forming the largest perturbation to the stratospheric aerosol layer since the aerosol cloud of Krakatau in 1883. The aerosol cloud spread rapidly around the globe in about 3 weeks and attained global coverage 1 year after the eruption. The SO2 release was sufficient to generate over 25 Mt of sulfate aerosol, and peak local and regional midvisible optical depths of up to 0.4 were recorded. Global values after widespread dispersal and sedimentation of aerosol were about 0.1 to 0.15, with a residence time of over 2 years. This large aerosol cloud caused dramatic decreases in the amount of net radiation reaching the Earth's surface. This was certainly the largest atmospheric perturbation by an aerosol cloud in this century, producing a climate forcing two times stronger than the aerosols of El Chichón. The lower stratosphere also warmed immediately after the eruption and has cooled to the lowest temperatures recorded since then, causing changes in atmospheric circulation. Effects on climate were an observed surface cooling in the Northern Hemisphere of up to 0.5 to 0.6°C, equivalent to a hemispheric reduction in net radiation of 4 W/m2, and an overall cooling of perhaps as large as -0.4°C over large parts of the Earth in 1992-93. Climate models appear to have predicted the cooling currently occurring with a reasonable degree of accuracy. The Pinatubo climate forcing was stronger than the opposite, warming effects of either the El Niño event or anthropogenic greenhouse gases in the period 1991-93. Atmospheric composition also underwent some remarkable changes that were due to the Pinatubo aerosols, most notably that mid-latitude ozone abundance reached its lowest level on record during 1992-93. The total ozone amount was 2 to 3% lower than in any earlier year, with the largest decreases in the regions from 10° to 20°S. lat and 10° to 60° N. lat. The Southern Hemisphere "ozone hole" increased in 1992 to an unprecedented 27x106 km2 in size, and depletion rates were faster than ever before recorded. The atmospheric impact of the Pinatubo eruption has been profound, and it has sparked a lively interest in the role that volcanic aerosols have played in climate change. It has been an extremely important and timely event to the atmospheric sciences, permitting climate models to be tested and tuned, and showing that a powerful eruption providing a 15 to 20 Mt SO2 release into the stratosphere can produce sufficient aerosols to offset global warming trends and severely impact the ozone budget. We thank E.G. Dutton (NOAA Climate Monitoring and Diagnostic Laboratory (CMDL)), J.E. Hansen and H. Wilson (NASA Goddard Institute for Space Studies (GISS)), A. Robock (University of Maryland), and G. Stephens (NOAA-NESDIS) for generously providing data, and M.P. McCormick (NASA Langley Research Center), E.A. Dutton, P.B. Russell (NASA Ames Research Center), C.G. Newhall (USGS), A. Robock, L.S. Walter (NASA Goddard Space Flight Center), and A. Tabazadeh (University of California, Los Angeles) for reviews of earlier versions of the manuscript. This work was supported by NASA grants NAG 5-1839 and NAG W-3721. This is SOEST contribution No. 3563. Angell, J.K., 1988, Impact of El Niño on the delineation of tropospheric cooling due to volcanic eruptions: Journal of Geophysical Research, v. 93, p. 3697-3704. ------1990, Variation in global tropospheric temperature after adjustment for the El Niño influences, 1958-1989: Geophysical Research Letters, v. 17, p. 1093-1096. ------1993, Comparison of stratospheric warming following Agung, El Chichón and Pinatubo volcanic eruptions: Geophysical Research Letters, v. 20, p. 715-718. Angell, J.K., and Korshover, J., 1983, Comparison of stratospheric warming following Agung and El Chichón: Monthly Weather Review, v. 111, p. 2129-2135. Ansmann, A., Wandinger, U., and Weitkamp, C., 1993, One-year observations of Mount-Pinatubo aerosol with an advanced raman lidar over Germany at 53.5N: Geophysical Research Letters, v. 20, p. 711-714. Arctowski, H., 1915, Volcanic dust veils and climatic variations: Annals of the New York Academy of Sciences, v. 26, p. 149-174. Asano, S., 1993, Estimation of the size distribution of Pinatubo volcanic dust from Bishop's ring simulations: Geophysical Research Letters, v. 20, p. 447-450. Asano, S., Uchiyama, A., and Shiobara, M., 1993, Spectral optical thickness and size distribution of the Pinatubo volcanic aerosols as estimated by ground-based sun photometry: Meteorological Society of Japan Bulletin, v. 71, p. 165-173. Barton, I.J., Prata, A.J., Watterson, I.G., and Young, S.A., 1992, Identification of the Mount Hudson volcanic cloud over SE Australia: Geophysical Research Letters, v. 19, p. 1211-1214. Bassett, G.W., and Lin, Z., 1993, Breaking global temperature records after Mt. Pinatubo: Climatic Change, v. 25, p. 179-184. Bhartia, P.K., Herman J., and McPeters, R.D., 1993, Effect of Mount Pinatubo aerosols on total ozone measurements from backscatter ultraviolet (BUV)experiments: Journal of Geophysical Research v. 98, p. 18547-18554. Bluth, G.J.S., Doiron, S.D., Schnetzler, C.C., Krueger, A.J., and Walter, L.S., 1992, Global tracking of the SO2 clouds from the June 1991 Mount Pinatubo eruptions: Geophysical Research Letters, v. 19, p. 151-154. Brasseur, G., 1992, Ozone depletion: Volcanic aerosols implicated: Nature, v. 359, p. 275-276. Christy, J.R., and Drouilhet, S.J., 1994, Variability in daily, zonal-mean lower-stratospheric temperatures: Journal of Climate, v. 7, p.106-120. Defoor, T.E., Robinson, E., and Ryan, S., 1992, Early LIDAR observations of the June 1991 Pinatubo eruption plume at Mauna Loa Observatory, Hawaii: Geophysical Research Letters, v. 19, p. 187-190. Deshler, T., Adriani, A., Gobbi, G.P., Hofmann, D.J., DiDonfrancesco, G., and Johnson, B.J, 1992a, Volcanic aerosol and ozone depletion within the Antarctic polar vortex during the austral spring of 1991: Geophysical Research Letters, v. 19, p. 1819-1822. Deshler, T., Hofmann, D.J., Johnson, B.J., and Rozier, W.R., 1992b, Balloonborne measurements of Mt. Pinatubo aerosol size distribution and volatility at Laramie, Wyoming, during the summer of 1991: Geophysical Research Letters, v. 19, p. 199-202. Deshler, T., Johnson, B.J., and Rozier, W.R., 1993, Balloonborne measurements of Pinatubo aerosol during 1991 and 1992 at 41°N: Vertical profiles, size distribution and volatility: Geophysical Research Letters, v. 20, p. 1435-1438. Devine, J.D., Sigurdsson, H., Davis, A.N., and Self, S., 1984, Estimates of sulfur and chlorine yield to the atmosphere from volcanic eruptions and potential climatic effects: Journal of Geophysical Research, v. 89, p. 6309-6325. Doiron, S.D., Bluth, G.J.S., Schnetzler, C.C., Krueger, A.J., and Walter, L.S., 1991, Transport of Cerro Hudson SO2 clouds: Eos, Transactions, American Geophysical Union, v. 72, no. 45, p. 489, 498. Dutton, E.G., and Christy, J.R., 1992, Solar radiative forcing at selected locations and evidence for global lower tropospheric cooling following the eruptions of El Chichón and Pinatubo: Geophysical Research Letters, v. 19, p. 2313-2316. Dutton, E.G., Reddy, R., Ryan, S., and DeLuisi, J., 1994, Features and effects of aerosol optical depth observed at Mauna Loa, Hawaii, 1982-1992: Journal of Geophysical Research, v. 99, p.8295-8306. Farman, J.C., Gardiner, B.G., and Shanklin, J.D., 1985, Large losses of total O3 in atmosphere reveal seasonal ClOx/NOx interaction: Science, v. 211, p. 832-834. Fierstein, J., and Hildreth, W., 1992, The plinian eruptions of 1912 at Novarupta, Katmai National Park, Alaska: Bulletin of Volcanology, v. 54, p. 646-684. Gleason, J.F., Bhartia, P.K., Herman, J.R. and others, 1993, Record low global ozone in 1992: Science, v. 260, p. 523-526. Graf, H-F., Kirchner, I., Robock, A., and Schult, I., 1993, Pinatubo eruption winter climate effects: Model versus observations: Climate Dynamics, v. 9, p. 81-93. Grainger, R.G., Lambert, A., Taylor, F.W., Remedios, J.J., Rodgers, C.D., and Corney, M., 1993, Infrared absorption by volcanic stratospheric aerosols observed by ISAMS: Geophysical Research Letters, v. 20, p. 1293-1286. Grant, J., Fishman, J., Browell, E.V., and others, 1992, Observations of reduced ozone concentrations in the tropical stratosphere after the eruption of Mt. Pinatubo: Geophysical Research Letters, v. 19, p. 1109-1112. Groisman, P.Ya., 1992, Possible regional climate consequences of the Pinatubo eruption: An empirical approach: Geophysical Research Letters, v. 19, p. 1603-1606. Hamill, P., Kiang, C.S., and Cadle, R.D., 1977, The nucleation of H2SO4-H2O solution aerosol particles in the stratosphere: Journal of the Atmospheric Sciences, v. 34, p. 150-162. Handler, P., 1989, The effect of volcanic aerosols on global climate: Journal of Volcanology and Geothermal Research, v. 37, p. 233-249. Hansen, J., Lacis, A., Ruedy, R., and Sato, M., 1992, Potential climate impact of the Mount Pinatubo eruption: Geophysical Research Letters, v. 19, p. 215-218. Hansen, J., Lacis, A., Ruedy, R., Sato, M., and Wilson, H., 1993, How sensitive is the world's climate? : National Geographic Research and Exploration, v. 9, p. 143-158. Hansen, J., and Lebedeff, S., 1987, Global trends of measured surface air temperature: Journal of Geophysical Research, v. 92, p. 13345-13372. Hansen, J.E., Wang, W.-C., and Lacis, A., 1978, Mount Agung eruption provides test of a global climatic perturbation: Science, v. 199, p. 1065-1068. Hansen, J., and Wilson, H., 1993, Commentary on the significance of global temperature records: Climate Change, v. 25, p. 185-191. Hattori, K., 1993, High-sulfur magma, a product of fluid discharge from underlying mafic magma: Evidence from Mount Pinatubo, Philippines: Geology, v. 21, p. 1083-1086. Hildreth, W., and Drake, R.E., 1992, Volcan Quizapu, Chilean Andes: Bulletin of Volcanology, v. 54, p. 93-125. Hofmann, D.J., and Oltmans, S.J, 1993, Anomalous Antarctic ozone during 1992: Evidence for Pinatubo volcanic aerosol effects, Journal of Geophysical Research, v. 98, p. 18555-18561. Hofmann, D.J., Oltmans, S.J., Harris, S., Komhyr, W.D., Lathrop, J.A., Defoor, T., and Kuniyuki, D., 1993, Ozonesonde measurements at Hilo, Hawaii, following the eruption of Pinatubo: Geophysical Research Letters, v. 20, p.1555-1558. Hofmann, D.J., Oltmans, S.J., Harris, S., Solomon, S., Deshler, T., and Johnson, B.J., 1992, Observation and possible causes of new ozone depletion in Antarctica in 1991: Nature, v. 359, p. 283-287. Hofmann, D.J., Oltmans, S.J., Komhyr, W.D., Harris, J.M., Lathrop, A., Langford, A.O., Deshler, T., Johnson, B.J., Torres, A., and Matthews, W.A., 1994a, Ozone loss in the lower stratosphere over the United States in 1992-1993: Evidence for heterogeneous chemistry of the Pinatubo aerosol: Geophysical Research Letters, v. 21, p. 65-68. Hofmann, D.J., Oltmans, S.J., Lathrop, J.A., Harris, J.M., and Vömel, H., 1994b, Record low ozone at the South Pole in the Spring of 1993: Evidence for heterogeneous chemistry of the Pinatubo aerosol: Geophysical Research Letters, v. 21, p. 421-424. Hofmann, D.J., and Solomon, S., 1989, Ozone destruction through heterogeneous chemistry following the eruption of El Chichón: Journal of Geophysical Research, v. 94, p. 5029-5041. Holasek, R.E., 1995, Volcanic eruption plumes: Satellite remote sensing observations and laboratory experiments: unpub. Ph.D. thesis, University of Hawaii at Manoa, 252 p.
Holasek, R.E., and Self, S., 1995, GOES weather satellite observations and measurements of the May 18, 1980, Mount St. Helens eruption: Journal of Geophysical Research, v. 100, p. 8469-8487. Jäger, H., 1992, The Pinatubo eruption cloud observed by LIDAR at Garmisch-Partenkirchen: Geophysical Research Letters, v. 19, p. 191-194. Jensen, E.J., and Toon, O.B., 1992, The potential effects of volcanic aerosols on cirrus cloud microphysics: Geophysical Research Letters, v. 19, p. 1759-1762. Kimball, H.H., 1918, Variation in solar radiation intensities: Monthly Weather Review, v. 46, p. 355-356. ------1924, Variation in solar radiation intensities measured at the surface of the Earth: Monthly Weather Review, v. 52, p. 527-529. Koyaguchi, T., and Tokuno, M., 1993, Origin of the giant eruption cloud of Pinatubo, June 15, 1991: Journal of Volcanology and Geothermal Research, v. 55, p. 85-96. Labitzke, K., and McCormick, M.P., 1992, Stratospheric temperature increases due to Pinatubo aerosols: Geophysical Research Letters, v. 19, p. 207-210. Lacis, A., Hansen, J., and Sato, M., 1992, Climate forcing by stratospheric aerosols: Geophysical Research Letters, v. 19, p. 1607-1610. Long, C.S., and Stowe L.L., 1994, Using the NOAA/AVHRR to study stratspheric aerosol optical thicknesses following the Mt. Pinatubo eruption: Geophysics Research Letters, v. 21, p. 2215-2218. Luhr, J.F., Carmichael, I.S.E., and Varekamp, J.C., 1984, The 1982 eruptions of El Chichón volcano, Chiapas, Mexico: mineralogy and petrology of the anhydrite-bearing pumices: Journal of Volcanology and Geothermal Research, v. 23, p. 69-108. Mankin, W.G., Coffey, M.T., and Goldman, A., 1992, Airborne observations of SO2, HCl, and O3 in the stratospheric plume of the Pinatubo volcano in July 1991: Geophysical Research Letters, v. 19, p. 179-182. McCormick, M.P., Thomason, L.W., and Trepte, C.R., in press, Atmospheric effects of the Mt. Pinatubo Eruption: Nature. McCormick, M.P., and Veiga, R.E., 1992, SAGE II measurements of early Pinatubo aerosols: Geophysical Research Letters, v. 19, p. 155-158. McPeters, R.D., 1993, The atmospheric SO2 budget for Pinatubo derived from NOAA-11 SBUV/2 spectral data: Geophysical Research Letters, v. 20, p. 1971-1974. Minnis, P., Harrison, E.F., Stowe, L.L., Gibson, G.G., Denn, F.M., Doelling, D.R., and Smith, W.L., Jr., 1993, Radiative climate forcing by the Mount Pinatubo eruption: Science, v. 259, p. 1411-1415. Mo, K.C., and Wang, X., 1994, The global climate of June-August 1992: Warm ENSO episode decays and colder than normal conditions dominate the Northern Hemisphere: Journal of Climate, v. 7, p. 335-357. Monastersky, R., 1994, Climate still reeling after Pinatubo blast: Science News, v. 145, p. 70. Nardi, B., Chanin, M.-L., Hauchecorne, A., Avdyushin, S.I., Tulinov, G.F., Ivanov, M.S., Kuzmenko, B.N., and Mezhuev, I.R., 1993, Morphology and dynamics of the Pinatubo aerosol layer in the Northern Hemisphere as detected from a ship-borne Lidar: Geophysical Research Letters, v. 20, p. 1967-1970. Pinatubo Volcano Observatory Team, 1991, Lessons form a major eruption: Mt. Pinatubo, Philippines: Eos, Transactions, American Geophysical Union, v. 72, p. 545, 552-553, 555. Pitari, G., 1992, On the possible perturbation of stratospheric dynamics due to Pinatubo aerosols: Il Nuovo Cimento; Note Brevi, v. 15C, p. 485-489. Pittock, A.B., 1992, Eruption of Mount Pinatubo: CSIRO Climate Change Research and Progress, Annual Report 1990-1991, p. 17. Post, M.J., Grund, C.J., Langforn, A.O., and Proffitt, M.H., 1992, Observations of Pinatubo ejecta over Boulder, Colorado by LIDARs of three different wavelengths: Geophysical Research Letters, v. 19, p. 195-198. Prather, M., 1992, Catastrophic loss of stratospheric ozone in dense volcanic clouds: Journal of Geophysical Research, v. 97, p. 10187-10191. Pueschel, R.F., Snetsinger, K.G., Russel, P.B., Kinne, S.A., and Livington, J.M., 1992, The effects of the 1991 Pinatubo volcanic eruption on the optical and physical properties of stratospheric aerosols, in Keevalik, S., ed., Proceedings, IRS92: Current problems in atmospheric radiation: A.Deepak Publishing Co., p. 183-186. Read, W.G., Froidevaux, L., and Waters, J.W., 1993, Microwave limb sounder measurement of SO2 from Mt. Pinatubo volcano: Geophysical Research Letters, v. 20, p. 1299-1302. Ramanathan, V., 1988, The greenhouse theory of climate change: A test by inadvertent global experiment: Science, v. 240, p. 293-299. Rampino, M.R., and Self, S., 1982, Historic eruptions of Tambora (1815), Krakatau (1883), and Agung (1963), their stratospheric aerosols and climatic impact: Quaternary Research, v. 18, p. 127-143. ------1984, Sulphur-rich volcanic eruptions and stratospheric aerosols: Nature, v. 310, p. 677-679. Robock, A., and Liu, Y., 1994, The volcanic signal in Goddard Institute for Space Studies three-dimensional model simulations: Journal of Climate, v. 7, p. 44-55. Robock, A., and Mao, J., 1992, Winter warming from large volcanic eruptions: Geophysical Research Letters, v. 19, p. 2405-2408. ------1995, The volcanic signal in surface temperature records: Journal of Climate, v. 8, p. 1086-1103. Rosen, J., Kjome, N.T., and Fast, H., 1992, Penetration of Mt. Pinatubo aerosols into the north polar vortex: Geophysical Research Letters, v. 19, p. 1751-1754. Rosen, J., Kjome, N.T., Fast, H., and Larsen, N., 1994, Volcanic aerosols and polar stratospheric clouds in the winter 1992/1993 in the north polar vortex: Geophysical Research Letters, v. 20, p. 61-64. Russell, P.B., Livingston, J.M., Dutton, E.G., Pueschel, R.F., and others, 1993b, Pinatubo and pre-Pinatubo optical depth spectra: Mauna Loa measurements, comparison, inferred particle size distribution; radiative effects, and relationship to Lidar data: Journal of Geophysical Research, v. 98, p. 22969-22985. Russell, P.B., Livingston, J.M., Pueschel, R.F., Reagan, J.A., and others, 1993a, Post-Pinatubo optical depth spectra vs. latitude and vortex structure: Airborne tracking sunphotometer measurements in AASEII: Geophysical Research Letters, v. 20, p. 2571-2574. Sato, M., Hansen, J.E., McCormick, M.P., and Pollack, J.B., 1993, Stratospheric aerosol optical depths, 1850-1990: Journal of Geophysical Research, v. 98, p. 22987-22994. Saunders, R., 1993, Radiative properties of Mount Pinatubo volcanic aerosols over the tropical Atlantic: Geophysical Research Letters, v. 20, p. 137-140. Schoeberl, M.R., Bhartia, P.K., and Hilsenrath, E., 1993, Tropical ozone loss following the eruption of Mt. Pinatubo: Geophysical Research Letters, v. 20, p. 29-32. Self, S., and King, A.J., 1993, The 1963 eruption of Gunung Agung, Bali, and its atmospheric impact [abs. ]: Eos, Transactions, American Geophysical Union, v. 74, no. 43, p. 105. Smith, R.C., Prezelin, B.B., Baker, K.S., Bidigare, R.R., and others, 1992, Ozone depletion: Ultraviolet radiation and phytoplankton biology in Antarctic waters: Science, v. 255, p. 952-959. Smithsonian Institution, 1991, Pinatubo: Bulletin of the Global Volcanism Network, Smithsonian Institution, v. 16, no. 5, p. 2-8. Solomon, S., Sanders, R.W., Garcia, R.R., and Keys, J.G., 1993, Increased chlorine dioxide over Antarctica caused by volcanic aerosols from Mount Pinatubo: Nature, v. 363, p. 245-248. Stone, R.S., Keys, J., and Dutton, E.G., 1993, Properties and decay of stratospheric aerosols in the Arctic following the 1991 eruptions of Mount Pinatubo: Geophysical Research Letters, v. 20, p. 2539-2362. Stothers, R.S., 1984a, Mystery cloud of ad 536: Nature, v. 307, p. 344-345. ------1984b, The great Tambora eruption and its aftermath: Science, v. 224, p. 1191-1198. Stowe, L.L., Carey, R.M., and Pellegrino, P.P., 1992, Monitoring the Mt. Pinatubo aerosol layer with NOAA-11 AVHRR data: Geophysical Research Letters, v. 19, p. 159-162. Strong, A.E., and Stowe, L.L., 1993, Comparing stratospheric aerosols from El Chichón and Mount Pinatubo using AVHRR data: Geophysical Research Letters, v. 20, p. 1183-1186. Tabazadeh, A., and Turco, R.P., 1993, Stratospheric chlorine injection by volcanic eruptions: Hydrogen chloride scavenging and implications for ozone: Science, v. 20, p. 1082-1086. Tanaka, S., Sugimura, T., Harada, T., and Tanaka, M., 1991, Satellite observations of the diffusion of Pinatubo volcanic dust to the stratosphere: Journal of the Remote Sensing Society of Japan, v. 11, p. 91-99 [in Japanese with English abstract]. Thomason, L.W., 1992, Observations of a new SAGE II aerosol extinction mode following the eruption of Mt. Pinatubo: Geophysical Research Letters, v. 19, p. 2179-2182. Tokuno, M., 1991a, GMS-4 observations of volcanic eruption clouds from Mt. Pinatubo, Philippines: Journal of Remote Sensing Society of Japan, v. 11, p. 81-89 [in Japanese with English abstract]. Tokuno, M., 1991b, GMS-4 observations of volcanic eruption clouds from Mt. Pinatubo, Philippines: Meteorological Satellite Center, Tokyo, Japan, Technical Note No. 23, p. 1-14. Trepte, C.R., and Hitchman, M.H., 1992, Tropical stratospheric deduced from satellite aerosol data: Nature, v. 355, p. 626-628. Trepte, C.R., Viega, R.E., and McCormick, M.P., 1993, The poleward dispersal of Mount Pinatubo aerosol: Journal of Geophysical Research, v. 98, p. 18563-18573. Turco, R., 1991, Volcanic aerosols: Chemistry, microphysics, evolution and effects, in Walter, L.S., and de Silva, S., eds., Volcanism-climate interactions: NASA Conference Publication 10062, p. D1-D30. Valero, F.P.J., and Pilewskie, P., 1992, Latitudinal survey of spectral optical depths of the Pinatubo volcanic cloud--derived particle sizes, columnar mass loadings, and effects on planetary albedo: Geophysical Research Letters, v. 19, p. 163-166. Varekamp, J.C., Luhr, J.F., and Prestegaard, K.L., 1984, The 1982 eruptions of El Chichón volcano, Chiapas, Mexico: Character of the eruptions, ash-fall deposits, and gas phase: Journal of Volcanology and Geothermal Research, v. 23, p. 39-68. Vogelmann, A.M., Ackerman, T.P., and Turco, R.P., 1992, Enhancements in biologically effective ultraviolet radiation following volcanic eruptions: Nature, v. 359, p. 47-49. Wallace, L., and Livingston, W., 1992, The effect of the Pinatubo cloud on hydrogen chloride and hydrogen fluoride: Geophysical Research Letters, v. 19, p. 1209-1211. Walsh, K., and Pittock, A.B., 1992, Modeling the effects of the Mt. Pinatubo eruption on sea surface temperatures in the southern hemisphere: Australian Meteorological and Oceanographic Society Bulletin, v. 5, p. 31-35. Weaver, A., Loewenstein, M., Podolske, J.R., and others, 1993, Effects of Pinatubo aerosol on stratospheric ozone at mid-latitudes: Geophysical Research Letters, v. 20, p. 2515-2518. Westrich, H.R., and Gerlach, T.M., 1992, Magmatic gas source for the stratospheric SO2 cloud from the June 15, 1991, eruption of Mount Pinatubo: Geology, v. 20, p. 867-870. Williams, S.N., and Self, S., 1983, The October 1902 plinian eruption of Santa María volcano, Guatemala: Journal of Volcanology and Geothermal Research, v. 16, p. 33-56. Wilson, L., and Walker, G.P.L., 1987, Explosive volcanic eruptions--VI. Ejecta dispersal in Plinian eruptions: The control of eruption conditions and atmospheric properties: Geophysical Journal of the Royal Astronomical Society, v. 89, p. 657-679. Winker, D.M., and Osborn, M.T., 1992a, Preliminary analysis of observations of the Pinatubo volcanic plume with a polarization-sensitive LIDAR: Geophysical Research Letters, v. 19, p. 155-158. ------1992b, Airborne LIDAR observations of the Pinatubo volcanic plume: Geophysical Research Letters, v. 19, p. 167-170. Wolff, E.W., and Mulvaney, R., 1991, Reactions on sulphuric acid aerosols and on polar stratospheric clouds in the Antarctic stratosphere: Geophysical Research Letters, v. 18, p. 1007-1010. Woods, A.W., and Self, S., 1992, Thermal disequilibrium at the top of volcanic clouds and its effect on estimates of the column heights: Nature, v. 355, p. 628-630. Woods, A.W., and Wohletz, K., 1991, Dimensions and dynamics of co-ignimbrite eruption columns: Nature, v. 350, p. 225-227.